Dissolve the boullion cube in the hot water. Combine uncooked vegetables, uncooked meats, salt, pepper, monosodium glutamate, and boullion. Roll out pastry dough into 6"x8" rectangles. Place about 1 1/2 cups of filling in the center of each rectangle. Bring 6" sides together and seal. 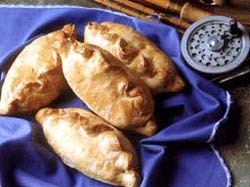 Cut a slit in the top of each pasty. Place on a dull, not black, baking pan. Bake at 425 degrees Fahrenheit (220 C) for 45 minutes.